PURPOSE: The purpose of this study was to test the hypothesis that exposure to a directly transmitted human pathogen flu virus increases human social behavior presymptomatically. This hypothesis is grounded in empirical evidence that animals infected with pathogens rarely behave like uninfected animals, and in evolutionary theory as applied to infectious disease. Such behavioral changes have the potential to increase parasite transmission and/or host solicitation of care. METHODS: We carried out a prospective, longitudinal study that followed participants across a known point-source exposure to a form of influenza virus (immunizations), and compared social behavior before and after exposure using each participant as his/her own control. RESULTS: Human social behavior does, indeed, change with exposure. Compared to the 48 hours pre- exposure, participants interacted with significantly more people, and in significantly larger groups, during the 48 hours immediately post-exposure. standing of human-pathogen interactions, and will have implications for infectious disease epidemiology and prevention. Ann Epidemiol 2010;20:729–733. © 2010 Elsevier Inc. All rights reserved. KEY WORDS: Infectious Disease, Influenza, Human Social Behavior, Host-Pathogen Evolution, Sickness Behavior. Animals infected with pathogens rarely behave like uninfected animals. In some cases, the behavior of infected individuals is self-protective (e.g., behavioral fever, sickness behavior), and in other cases, it benefits the parasite (e.g., increases transmission or parasite survival). Klein (1) reviews the extensive evidence for parasitic influence on proximate mechanisms that mediate host social behavior. From the Graduate Program in Biomedical Anthropology, Department of Anthropology, Binghamton University (SUNY), Vestal, NY (C.R., E. C.S., S.F., P.A., V.D. ); the EvoS Institute for Advanced Studies, Bingham- ton University (SUNY), Vestal, NY (C.R. ); and the Department of Biology, Colorado State University, Fort Collins (J.M.). Address correspondence to: Chris Reiber, PhD, MPH, Department of Anthropology, Binghamton University, PO Box 6000, Binghamton, NY 13902-6000. Tel. : (607) 777-2643; Fax: (607) 777-2477. E-mail: creib-er@binghamton.edu. Received March 4, 2010; accepted June 16, 2010. Unclear whether the effect benefits the parasite or the host, and if there is a benefit, how it is achieved. What is clear is that the behavior of infected animals does not resemble that of uninfected conspecifics, and the difference has implica- tions for both the individual host and the movement of the pathogen through the host population (2). The gold standard for demonstrating parasite-induced behavioral change is experimental infection, and reason- ably, such studies are not often carried out on humans. Thus, despite abundant examples of behavioral change in nonhuman animals infected with parasites, evidence for parasite-induced behavioral change in humans is virtually nonexistent, except for diseases that directly involve the nervous system or musculature (e.g., rabies; see also Moore (2)). Of course, Toxoplasma gondii is well known for its asso- ciation with certain personality traits (3), but again, infec- tion was neither experimental nor randomly distributed over the study population; we cannot rule out the possibility that certain personality types are more prone to be exposed or susceptible to Toxoplasma. Despite these difficulties in the study of human disease and behavior, we nonetheless expect to see behavioral changes in infected humans, given the ubiquity of such changes in other taxa. With that expectation, we asked if exposure to a directly transmitted pathogendflu virusdwould affect the behavior of humans. We focused on social behavior because enhanced social behavior could potentially benefit either (or both) the parasite or the host. Parasites that manipulate hosts to increase social behavior may benefit through increased transmission; hosts that increase their social contacts might benefit through increased care from conspe- cifics. Thus, we hypothesized that on encountering flu virus, humans would increase their social behavior. Seasonal influenza is a representative, common, directly- transmitted human infection. According to the United States Center for Disease Control (4), the average time between exposure to seasonal influenza and symptom onset is 2 days (range: 1–4 days), and infected individuals are contagious a day before symptom onset and for several days thereafter (Fig. 1). Shedding of the virus peaks 2 days after exposure, and symptom scores peak on Day 3 (5). Once symptoms appear, transmission via social interactions may be reduced by the onset of sickness behavior. However, no sickness behavior is evident presymptomatically, making the social behavior of infected individuals at this time particularly important. Because of the inherent complications of experimental infection studies with humans, we sought an alternative method of identifying exposure to influenza. Many humans are exposed to a modified form of influenza virus every autumn in the form of flu vaccines. Although the immuni- zation rarely produces full-fledged sickness behavior or illness, its very success depends on the recipient’s body recognizing the antigenic threat and mounting an appro- priate immune response. We therefore used influenza immu- nization as a proxy for natural infection because it provides a known point-source exposure to a familiar directly- transmitted pathogen, and it elicits an immediate immune response similar to that induced by wild-type infection. FIGURE 1. 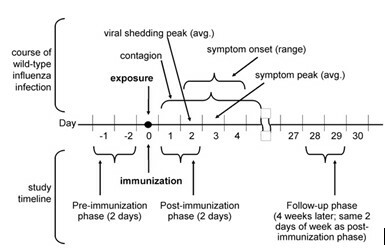 Timeline showing the course of wild-type influenza infection (top) and corresponding study phases (bottom). Infor- mation on the time course of wild-type influenza infection drawn from Coordinating Center for Infectious Diseases (4) and Carrat et al. (5). With the approval of our university’s fully accredited Human Subjects Research Review Committee (IRB) and under conditions of informed consent, we prospectively fol- lowed a cohort of adults across a period of time that included a known point-source exposure to viral antigens, and recorded the number and nature of social interactions. Participants were recruited at a campus flu-shot clinic and received a 0.5 mL injection of the Fluarix 2008–2009 vaccine (Glaxo SmithKline, Philadelphia, PA) containing 15 mg hemagglu- tinin of each of 3 strains: A/Brisbane/59/2007 (H1N1)-like virus (A/Brisbane/2007 IVR-148), A/Brisbane/10/2007 (H3N2)-like virus (A/Uruguay/716/2007 NYMC X-175C), and B/Florida/4/2006-like virus (B/Brisbane/3/2007). After receiving the immunization, individuals were invited to participate in a study about illness and social behavior; no explicit connection was made, at any time during the study, between the immunization and the objectives of the study. 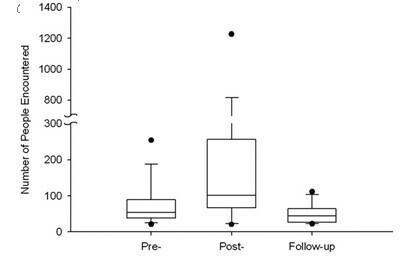 Data were collected 3 times: at baseline (at time of immu- nization), 48 hours later, and at follow-up 4 weeks later (Fig. 1). At each data collection point we used timeline follow-back methods (6) to reconstruct detailed information about participants’ activities during the past 48 hours. To eliminate confounds from other infectious illnesses, we re- corded symptoms of illness and medication use suggestive of underlying symptoms. We recorded every social interaction, its duration, and the number of participants in the interaction (after the Rochester Interaction Record) (7). To assess self- awareness of shifts in sociability, we recorded self-perceived sociability via Likert-type ratings for five items (8, 9). The items were: (1) I like to be with people; (2) I welcome the opportunity to mix socially with people; (3) I prefer working with others rather than working alone; (4) I find people more stimulating than anything else; and (5) I’d be unhappy if I were prevented from making many social contacts. We then compared social behavior in the 48 hours imme- diately before the immunization (the pre-immunization phase) to the 48 hours immediately after (the post- immunization phase), using each participant as his/her own control. Because the post-immunization phase included a Friday and/or Saturday for some participants, and social behavior patterns may vary by day of the week (e.g., week- ends vs. work days), ‘‘day-of-week’’ might confound results. We therefore also followed participants 4 weeks later, on the days of the week that corresponded to the post- immunization phase for each participant, to eliminate day- of-week confounds. We refer to this as the follow-up phase (Fig. 1). Finally, when we chose the time periods in the study, we made sure that they were routine work weeks and week- ends, free of any unusual events, holidays, or other factors that would systematically alter the normal time expenditure, behavior, and socialization patterns of participants. For each 48-hour time period, we scored each participant based on the following criteria: (1) total number of social events; (2) the total number of individuals with whom each participant interacted; (3) the mean number of individuals involved per social event; and (4) the mean duration of social encounters. Because the data fail to meet the assump- tions of parametric tests, statistical parameters shown here represent the median (range) unless otherwise noted, and statistical tests are nonparametric Wilcoxon signed rank tests. Given few tests and a small sample size, no correction has been made for multiple statistical tests (a Z 0.05 for all tests). Despite the limited duration of the flu clinics and the time-intensive nature of the interview techniques, we successfully enrolled 36 adults from the campus community as participants in the study. Mean age was 51.9 years (SD Z 8.3). There was an overall male/female ratio of 13:23. Thirty-one percent (n Z 11) were faculty; 69% (n Z 25) were staff. One individual failed to complete the initial week of data collection. As a result, comparisons between pre-immunization and post-immunization comprise 35 cases (34 degrees of freedom). Nine additional individuals did not participate in the follow-up data collection 1 month later. Thus, all comparisons between pre-immunization and 1 month follow-up comprise 26 individuals (25 degrees of freedom). 205 and 26.8, respectively; z Z -5.16, n Z 35, p Z 0.000). FIGURE 2. Number of people encountered is greater after immunization than before immunization or during follow-up. For each box plot, the lower and upper dots represent the 5th and 95th percentiles of the distribution, respectively; the whiskers represent the 10th and 90th percentiles, respectively; the lower and upper edges of the box represent the 25th and 75th percen- tiles, respectively; and the line through the center portion of the box is the median. Wilcoxon signed rank test comparing pre-immunization to post-immunization: z Z 3.08, n Z 35, p Z 0.002. Follow-up captures data on the same days of the week as post-immunization to rule out potential day-of-week confounds to social behavior. Wilcoxon signed rank test comparing pre-immunization to follow-up: z Z -1.90, n Z 26, p Z 0.058. The increase in social behavior seen post-immunization is therefore not confounded by day-of-week. respectively), and flirted with statistical significance (z Z 1.94, n Z 34, p Z 0.053). Moreover, there were no day-of-week confounds. If the increases in social behavior during the post-immunization phase were merely a result of the inclusion of weekend days for some participants, we would expect a similar increase in social behavior on the same days of the week during the follow-up phase. However, the increases in social behavior found during the post-immunization phase were not found on the same days of the week during the 4-week follow-up phase. In fact, during follow-up, social contacts were reduced from baseline (from 54 to 44.5 people; ranges 235 and 91, respectively; z Z -1.90, n Z 26, p Z 0.058; see Fig. 2), even though the follow-up phase included the same weekend days. Participants were unaware of any concurrent shifts in their sociability. None of the self-perceived sociability measures changed significantly during the course of the study. Apparently, self-perceived sociability is not medi- ating the behavioral change. In the 2 days immediately after influenza immunization, study participants socially encountered almost twice as many other humans as they did in the 2 days before immunization. Partic- ipants were not consciously aware of any changes in their levels of sociability, nor could the changes in their social behavior be accounted for by differences in social patterns associated with particular days of the week. Human social behavior changed on the introduction of viral antigens. There are some limitations to consider. For instance, the sample size was necessarily small due to the time-intensive timeline follow-back procedures. These procedures, although time-consuming, use memory aids to produce highly reliable data compared to other, faster recall methods (10). In addition, the impact of a small sample size is mitigated by the prospective, longitudinal design, paired with our ability to use each participant as his/her own control. Instead of comparing behavior across groups that might have unknown and potentially confounding differences, we were able to compare the behaviors of the same individuals at different times, making this a particularly powerful design. Finally, our ability to detect a significant behavioral change despite this small sample size and the use of stringent nonpara- metric statistical methods suggests that the result is indeed robust. It is theoretically possible that humans might generally respond to preventive health measures such as immunizations with a feeling of invincibility that could lead to enhanced social behavior, at least in the short term. If a response such as this exists, it could be mediated either consciously or unconsciously. In the event of conscious mediation, we would expect some level of conscious awareness of shifts in socia- bility. We looked for this, and found no such effects. If uncon- scious mediation of this effect exists, it presumably would occur through upregulation of the immune system in response to the immunization. However, it is reasonable to assume that most instances of acute upregulation of the immune system indicate actual infection rather than immunization; this was certainly the case throughout evolutionary history, before the very recent advent of vaccination. Thus, although there is room for exception, it seems unlikely that immune upregu- lation would signal invincibility. Nonetheless, a definitive dismissal of this possibility will require placebo-controlled trials in the future. The increase in social behavior after the immunization might be interpreted alternatively as a behavioral response resulting from participants’ knowledge that their social behavior would be recorded. Such an effect would not impact pre-immunization social behavior because the participants were not aware of the study until the point of immunization; but it would alter post-immunization behavior. Were this the case, we would expect the effect to also impact social behavior at the 4-week follow-up because participants were aware of the follow-up data collec- tion appointments. However, social behavior at the 4-week follow-up was lower than pre-immunization rather than higher. We conclude that this potential ‘‘knowledge effect’’ is not responsible for the changes we observe in social behavior on immunization. Of course, immunization is not identical to infection. The vaccine was not live, and influenza symptoms did not appear. However, the goal of immunization is to generate an immediate agent-specific immune response that protects the host against the wild-type pathogen. It is during this early response, common to both immunization and wild- type infection, and presymptomatic in the latter, that we predicted and found change in social behavior. This study does not identify the beneficiarydparasite or hostdof enhanced sociability. Answering this question will require placebo-controlled studies. The physiological and epidemiological ramifications of this altered behavior also remain to be investigated, as do its evolutionary roots. But if, for example, the body’s immediate response to the vaccine produces proinflammatory cytokines and chemo- kines, then altered communication in the central nervous system could lead to behavioral change in the host (1). This could happen with a live virus, but might also occur with killed vaccine. Thus, immunization in this case is indeed a reasonable proxy for natural infection. Regardless of the beneficiary of this behavioral effect, or when in our evolutionary history the effect might have evolved, the increase in human social behavior immediately on introduction of viral antigens has important implications for infectious disease epidemiology. It suggests that contact rates between hosts and susceptibles are neither linearly related to host density, nor independent of host density (2, 11). Instead, contact rates are changing within the course of infections as host behaviordhost social behavior in particulardchanges; our participants shifted to larger- group interactions, presumably with higher density, after exposure. These findings also highlight the importance of inapparent (asymptomatic) infections (12); in such infec- tions, individuals can transmit pathogens over long periods of time because there is no sickness behavior to reduce soci- ality. This effect could be compounded if social behavior is also enhanced. To our knowledge, this is the strongest indicator yet discov- ered of pathogen-mediated behavioral change in otherwise asymptomatic humans. Our results unambiguously point to increased social interaction after exposure. Much remains to be investigated regarding this interaction, and future directions include planned placebo-controlled trials, inves- tigations of the effect of unattenuated virus on human social behavior, and investigations of other directly trans- mitted human pathogens. If this behavioral shift occurs on exposure to live, unattenuated virus, understanding the epidemiological role of the presymptomatic host takes on added urgency. Klein SL. Parasite manipulation of the proximate mechanisms that mediate social behavior in vertebrates. Physiol Behav. 2003;79:441–449. Moore J. Parasites and the Behavior of Animals. New York: Oxford University Press; 2002. Flegr J. Effects of Toxoplasma on human behavior. Schizophr Bull. 2007;33:757–760. Coordinating Center for Infectious Diseases. Seasonal Influenza: Questions and Answers Available at: http://www.cdc.gov/flu/about/qa/disease.htm; 2008. Accessed September 1, 2008. Carrat F, Vergu E, Ferguson NM, Lemaitre M, Cauchemez S, Leach S, et al. Time lines of infection and disease in human influenza: a review of volunteer challenge studies. Am J Epidemiol. 2008;167:775–785. Alcohol Consumption: Psychosocial and Biochemical Methods. Totowa (NJ): Humana Press; 1992:41–72. Reis HT, Wheeler L. Studying social interaction with the Rochester Inter- action Record. Adv Exp Soc Psychol. 1991;24:269–318. Cheek JM, Buss AH. Shyness and sociability. J Pers Soc Psychol. 1981;41:330–339. Buss AH. The EAS theory of temperament. In: Strelau J, Angleitner A, eds. Explorations in Temperament: International Perspectives on Theory and Measurement. New York: Plenum Press; 1991:43–60. Sobell LC, Toneatto T, Sobell MB, Schuller R, Maxwell M. A procedure for reducing errors in reports of life events. J Psychosomat Res. 1990;34:163–170. Smith MJ, Telfer S, Kallio ER, Burthe S, Cook AR, Lambine X, et al. Host-pathogen time series data in wildlife support a transmission function between density and frequency dependence. Proc Natl Acad Sci. 2009;106:7905–7909. King AA, Ionides EL, Pascual M, Bouma MJ. Inapparent infections and cholera dynamics. Nature. 2008;454:877–880.